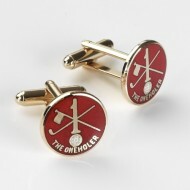 Golf Badges, Golf Tacs and Golf Cufflinks for golfers who have scored a hole in one or two or more holes in one! Captain Golfer Lapel Badge Navy Blue. Circular Enamel Lapel Badge. Lapel Badge.. 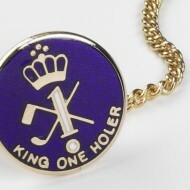 Junior Golf Captain Lapel Badge. 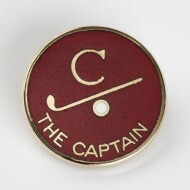 Lapel Badge to distinguish the Junior Captain Red,w..
Lady Captain Golfer Lapel Badge Red. Red Lapel Badge to distinguish the Lady Captain. Red ..
Lady Past Captain Golfer Lapel Badge Green. Lapel Badge to distinguish the Lady Past Capta..
Lady Vice Captain Golfer Lapel Badge Blue. Lapel Badge to distinguish the Lady Vice Captai..
Lady Captain Golfer Lapel Badge Blue. Lapel Badge to distinguish the Lady Captain. Blue wi..
Lady Captain Golfer Lapel Badge Green. Lapel Badge to distinguish the Lady Captain. ..
Lady Past Captain Golfer Lapel Badge Blue. Lapel Badge to distinguish the Lady Past Captai..
Lady Past Captain Golfer Lapel Badge Red. 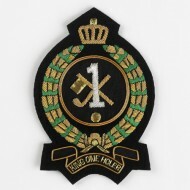 Lapel Badge to distinguish the Lady Past Captain..
Lady Vice Captain Golfer Lapel Badge Green. 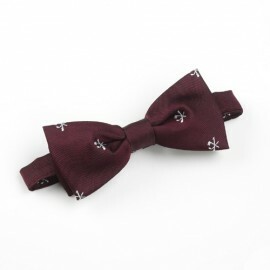 Lapel Badge to distinguish the Lady Vice Capta..